From Palisades Park right out to the Santa Monica Pier itself, Shred Nations Santa Monica can provide you with safe, secure, and reliable shredding services no matter your location. 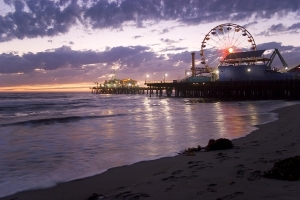 Attracting vacationers by the thousands all year-round, Santa Monica is not just a pleasant beach town, but also a hotbed of business as well. With densely populated downtown Los Angeles only a mere half hour away, this busy city creates a bustling document destruction industry, and at Shred Nations Santa Monica, we’re here to help. With shredding service options that range from a one-time shredding purge, to weekly, bi-weekly, and even monthly pickup schedules, Shred Nations Santa Monica strives to meet the needs of our customers no matter their shredding needs. Santa Monica Mobile Shredding—Looking for a way to get secure shredding services without making the trip to an offsite shredding facility? Our Santa Monica mobile shredding trucks can come right to your home or office curbside, shredding all your sensitive documents while you watch. Santa Monica Offsite Destruction—Widely considered the most efficient way of completing a large shredding project cheaply and quickly, our offsite shredding service at Shred Nations Santa Monica collect your materials before transporting them to be shredded at our secure offsite facilities. Santa Monica Electronic Media Destruction—Not only can Shred Nations Santa Monica ensure that all your hard-copy documents are securely shredded, we also provide electronic media destruction service, helping to destroy and properly dispose of digital media that contains potentially sensitive information. California Breach Notification Bill (AB-1710)—This California Breach Notification bill expands on laws that already protect the personal information California residents, requiring that in the event of a data breach, all affected individuals be immediately notified. California Assembly Bill 2246 (California Shredding Law)—This law lays a baseline for protecting consumers from identity theft by requiring that all business must properly destroy and dispose of all customer records. Receive a Free Quote on Shredding Services Anywhere in Santa Monica! If you or your business needs an answer to a shredding problem anywhere in the greater Santa Monica or Los Angeles area, then Shred Nations Santa Monica is your solution! Offering shredding services including electronic media destruction and mobile or offsite shredding, we’ve got you covered. Just give us a call at (310) 828-4900, or simply fill out the form to your right to request a free, no-obligation quote on any of our shredding services today! Our normal operating hours are Monday-Friday from 8:45 AM to 6:30 PM PST, and Saturday from 9:00 AM to 4:30 PM PST.